Do you dread going into the office on a Monday morning? Are you more excited when you’re working on your own projects, on your own timescale? Do you frequently feel stifled by the corporate culture, dream of being your own boss, or ever wonder what other career possibilities you might be capable of? It could be that working for someone else simply doesn’t suit your personality, and too often you find it clashing with your life and career goals. It’s blindingly obvious to you that A + B = C, but when you raise this at work your suggestions are either overlooked or disregarded by your company. Becoming a franchisee enables you to make key decisions on everything from business strategy, marketing and new hires. Frustrated, you can’t help yourself but deviate from the official script from time to time. But even if your deviation is a success, you get reprimanded from up above for not toeing the company line. You like getting out there and meeting people, and not being stuck in the office all day. You need change, variety and challenges to keep you stimulated and engaged. Otherwise your brain switches off and you slide into demotivated, snooze-cruise control. World Options offers franchise opportunities that enable you to network and connect with people on a day-to-day basis. You set the agenda. You find bureaucracy, red tape and office politics frustrating at best or a gruelling punishment at worst. Sometimes you want to simply get things done without jumping through hoops first or waiting a year (or more) for new ideas to be implemented. Whether it’s a small niggling feeling, or you’re largely confident you could be making waves doing something else, if it’s persistent and won’t go away then it’s worth pursuing. Ready to work for yourself? If the above resonates strongly with you, it may be time to consider working for yourself. 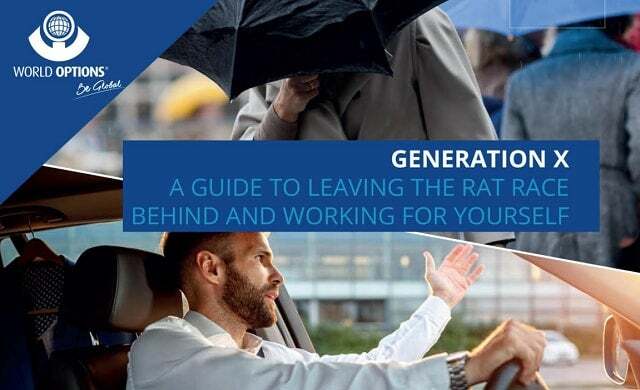 World Options has interviewed several people who have started their own business to create this free ebook here on Leaving the rat race behind and working for yourself. It reveals what kind of self-employment would be the best fit for you, what the next steps are that you’ll need to take and offers valuable insights from those who have gone before you.